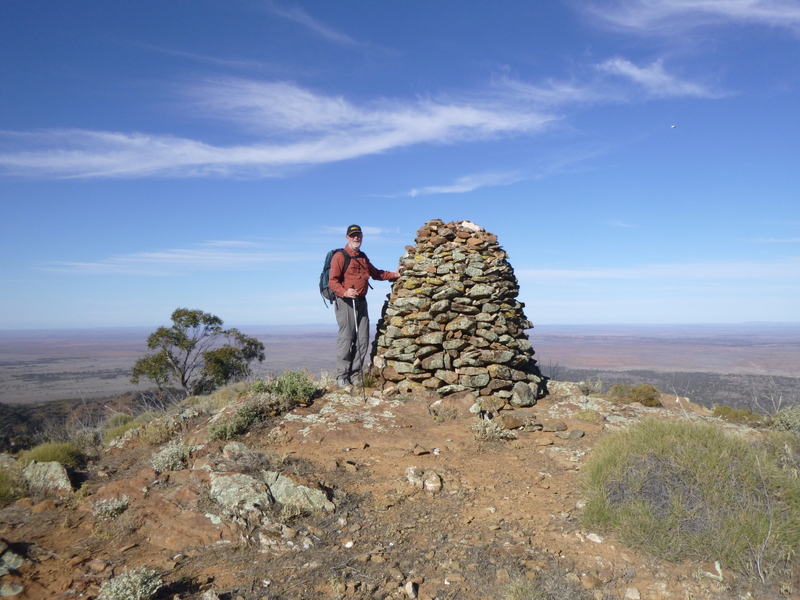 Hugh finally got free of his work so we took the opportunity to hit the summits in the Bendleby Ranges. We stayed this time at the Bendleby property which has accommodation for bush camping or cabins, we stayed in the shearers quarters with all the facilities to sleep and feed ourselves. First summit was west of Bendleby on Pamatta Station a large pastoral lease and Price Hill VK5/NE-056 is the summit. We met James the owner at his homestead when we arrived and discussed our intentions to hike to the summit. He was busy installing new water troughs for his sheep as it is the driest winter on record and their reliance on ground water is all they can do to keep their animals alive in these really hard times. We were able to find a way to cross a washed out creek this time and got about a kilometre closer to the summit to start our hike. 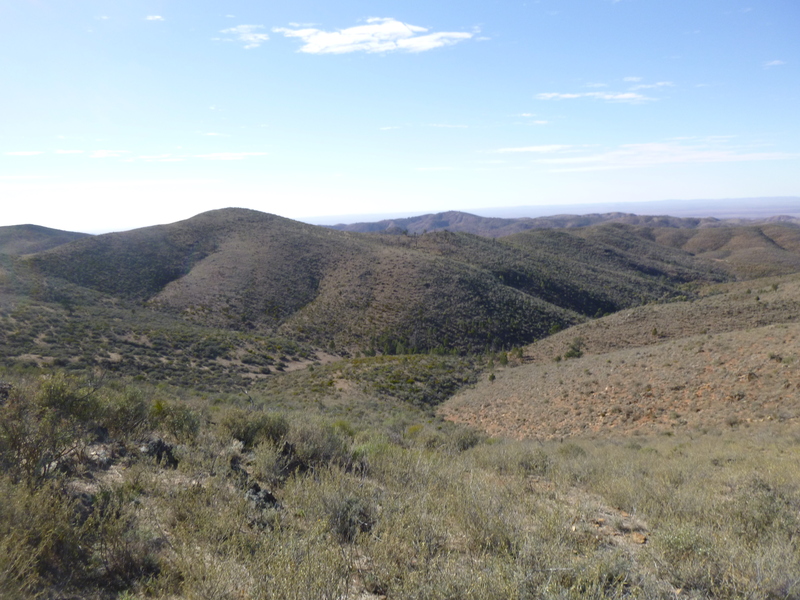 Price Hill is a bald range of hills with hardly any trees at all mostly rocks and spinifex grass on the top edge with a healthy population of Kangaroos . 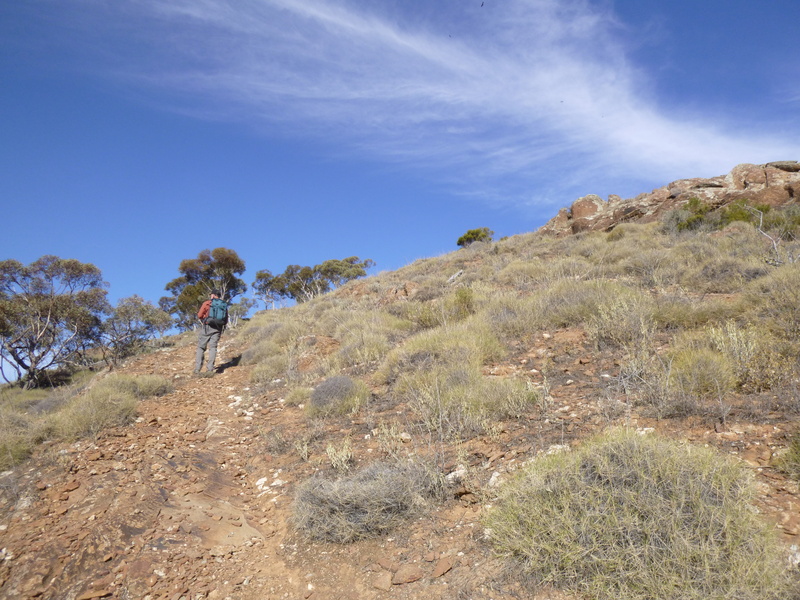 This time we found a better ridge line to get to the top but it’s still a medium to hard hike and we work on finding a better way every time we go to a summit but often you just have to slog till you get there. 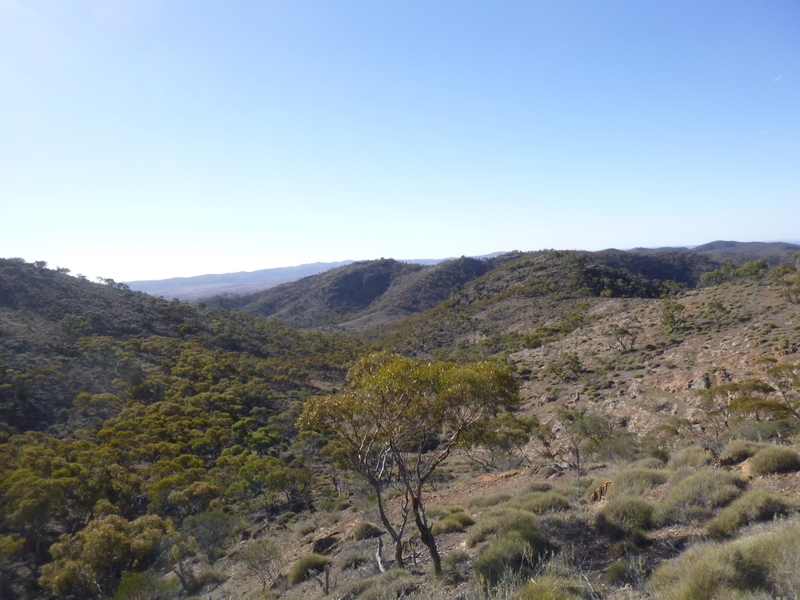 I recon it was about 3 km to the top this time taking about 1 hour. This washed out creek stopped us driving any further . View looking east and the CH 1 UHF CB repeater Fridge no beer. Irony is repeater is in a Fridge and the batteries are in an Esky. 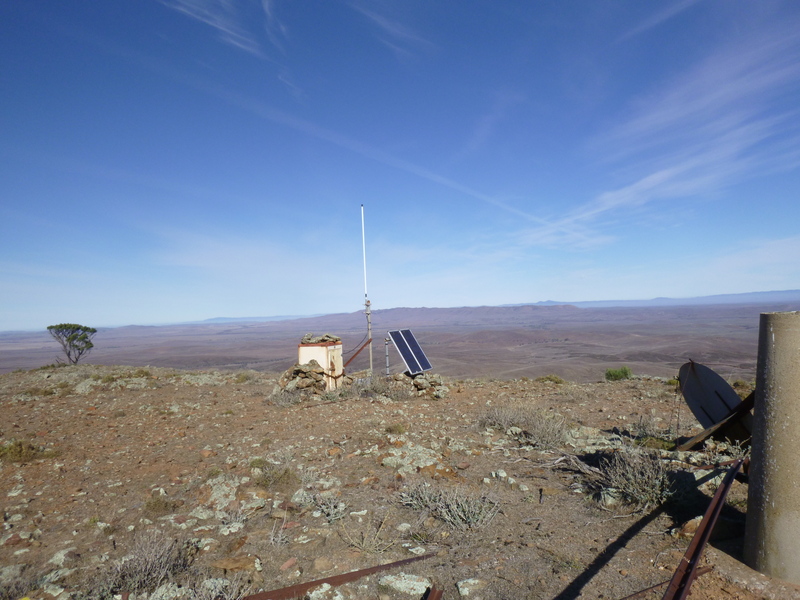 SOTA station set up Hugh and I just made enough contacts to qualify this summit as it was Friday and not many chasers. 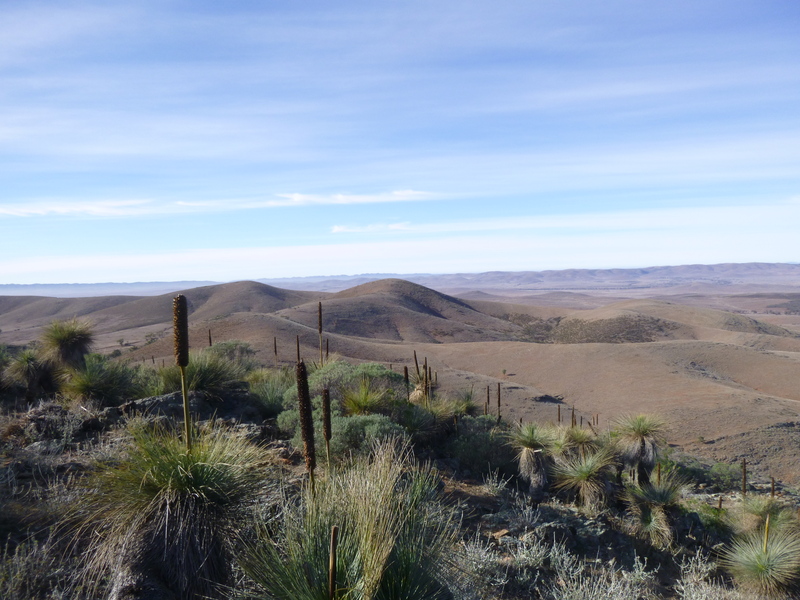 After making our way back to the sota transporter we headed 50 km back to the Bendelby’s to climb Eke Hill VK5/NE-069 a summit in the southern range of hills. More dusty tracks with a short distance in 4×4 this time to make the parking spot and tackle the next hike. Now that Hugh and I have been to this summit a few times we have the track worked out and made the summit in about 40 minutes. Very nice hike up the waterfall type creek then follow the ridge line to the top, medium hike. Customary pictures at the stone cairn then on with the activation great views out east from here. Band conditions were slightly better in the afternoon and I managed to make 5 qso’s and Hugh had the pile up with 7 qso’s on ssb . We had a really low output on ssb on the kx3 but it seemed to work to the power setting on cw and the chasers were telling us we were very low down even though some of them were over S 9 . After some checking of the rig I discovered that over time the mic gain had been turned off to almost zero. It is the same control as for cw and power settings but when on ssb it becomes the mic gain. So problem found and much to my relief nothing wrong with the rig just operator error. At last by the time Hugh was taking his turn on 40m ssb we had a great signal again,and the rig must have been running at 1 watt or even less before we discovered the problem, and I wonder how long it has been like that. 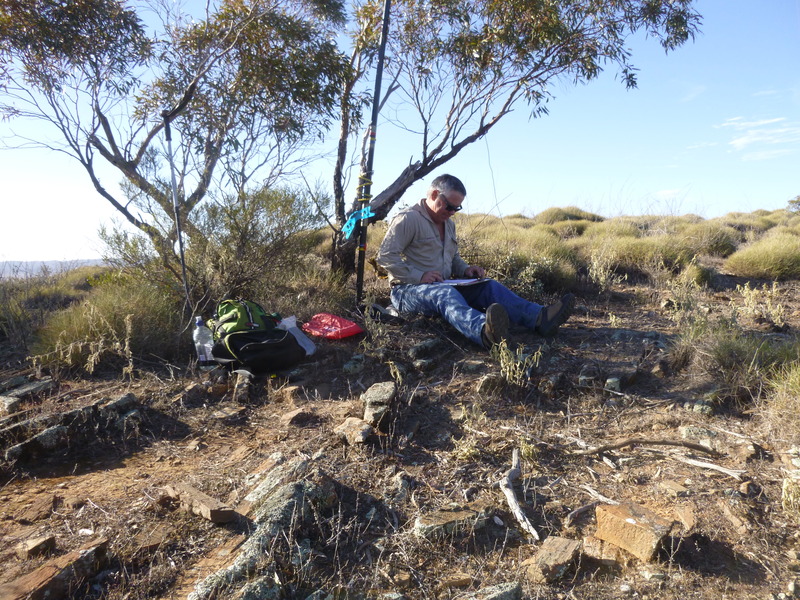 Back to camp for a feed and cleanup ready for bed to tackle two more summits on Saturday, there is no internet or tv here so not many distractions, I did manage an 80m mobile qso with Ian VK5IS a couple times while we were in down time. Marchant Hill VK5NE-043 was the first summit for the day which entails a drive to the Northern end of the property this time and it is a 6 pointer and this hike usually hurts. 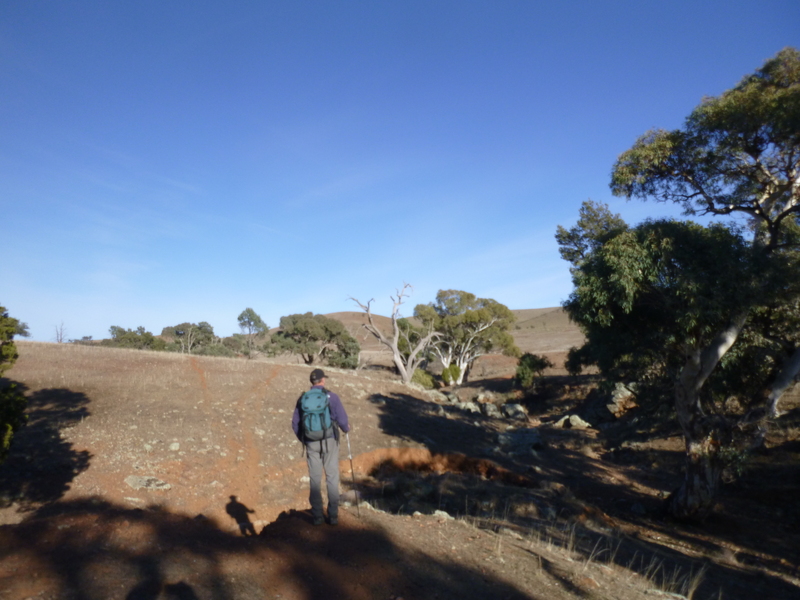 We were told by the property owners that a walking trail had been marked now for bush walkers so Hugh and I wanted to try it and see if it was easier. 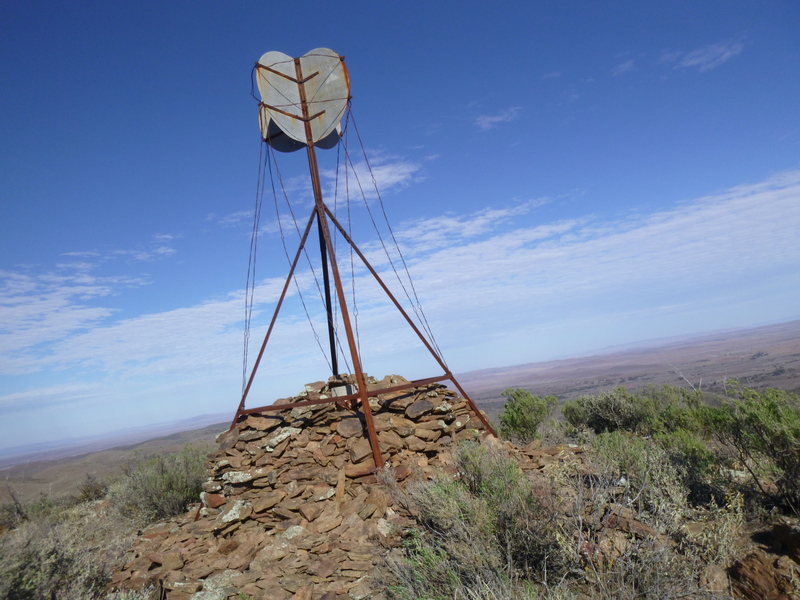 I must say the trail to get to the trig point was probably the best way to get there and we walked over two high saddles before we could see the summit. They marked the trail with red ribbons on the bushes and apparently the goats like to eat the ribbon so we got off line a few times but managed to be in the general area most of the time and took the obvious lines. On the way back I recorded several way points on the Etrex 30 and will pass on the information to Jane so others using GPS can find the trail and wear it in a bit. 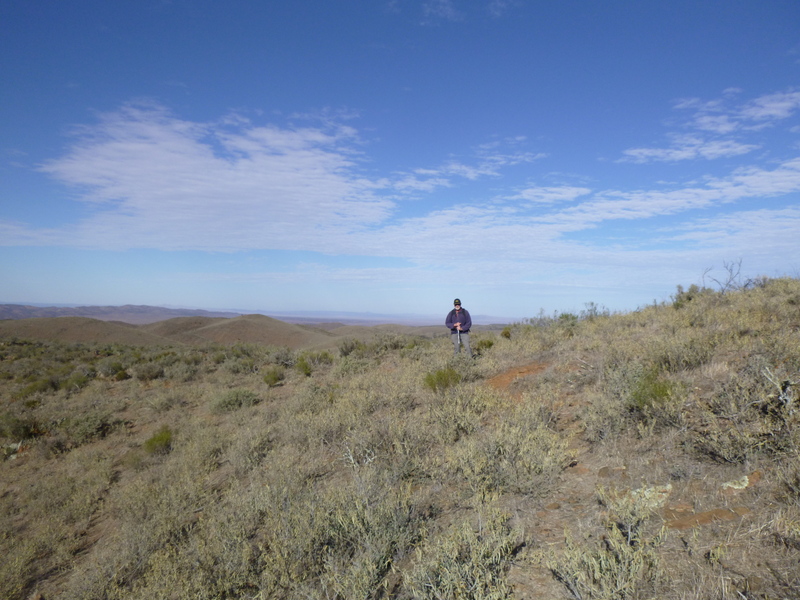 No trees here either and mostly low salt bush and rocks not as much Spinifex grass. 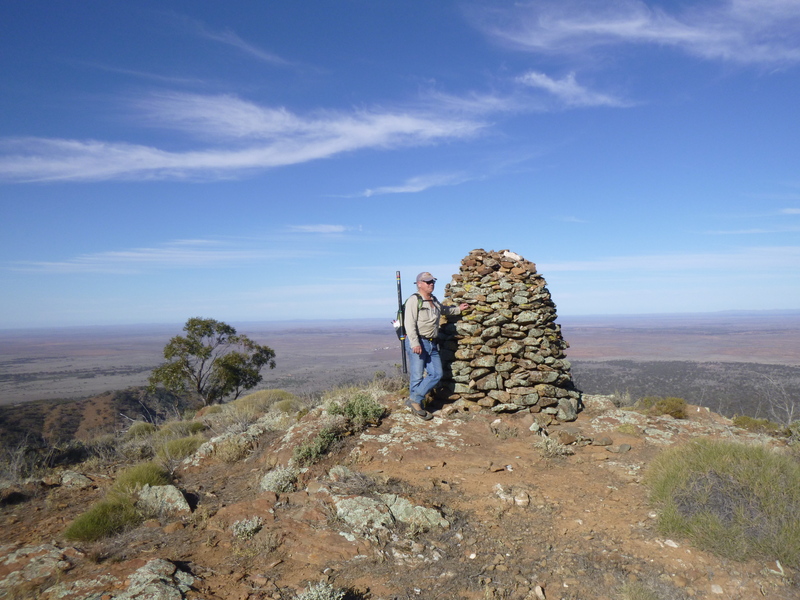 The very old style Trig Point on this summit and Hugh getting ready to operate. The wind was really strong so we found a spot on the eastern side as best we could out of most of the raging wind. 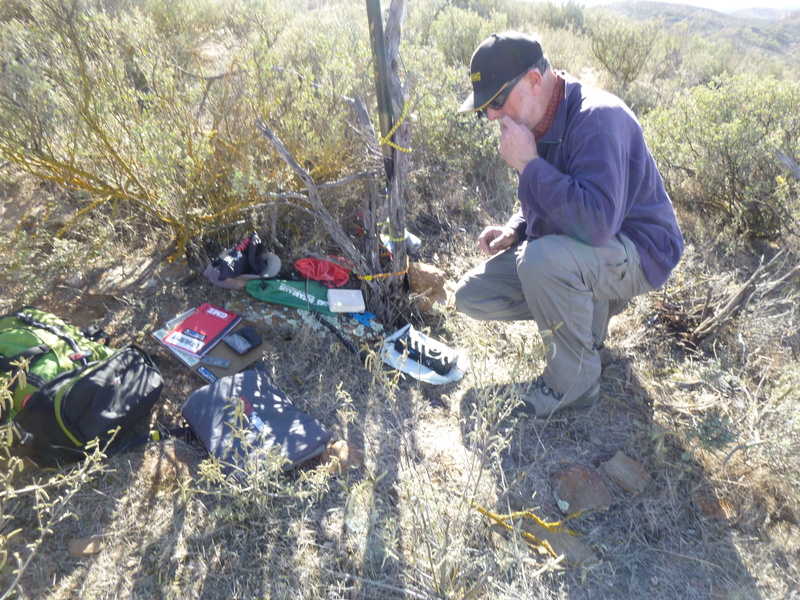 We only set the Squid Pole at 7 metres and the 80m extensions were not very high off the bushes but we managed some contacts with the locals on 80m ssb before changing to 40m . Hugh made a small score on ssb and a S2S with VK1DA then I had a go on cw making an S2S with Andrew also but on cw. 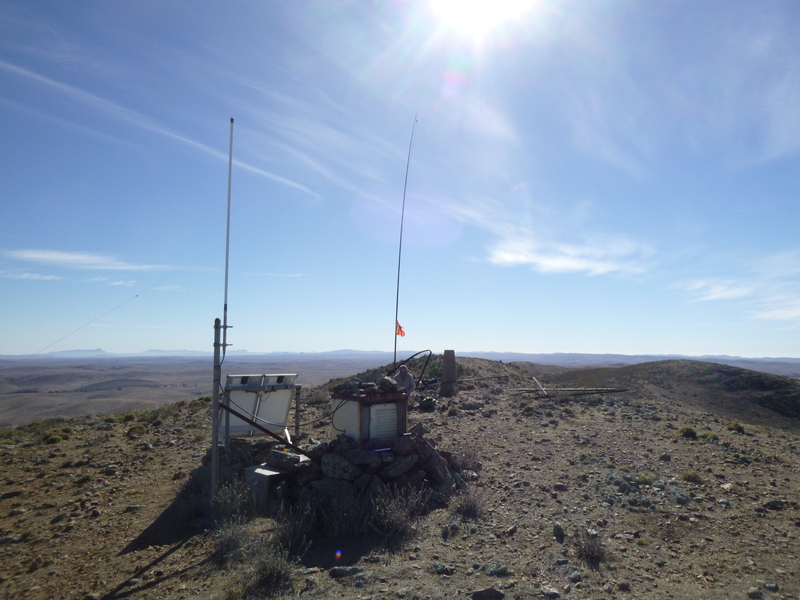 Good signals on 40m cw to vk1 2 3 but the wind was so bad and we could see the dust storm building so we made haste back to the sota transporter. After we got back to the camp ground the dust storm in the middle of winter was raging so we decided not to attempt the other summit after lunch and I loaded up and headed for home. We had originally planned to do 5 summits but access to Depot Hill was not possible that weekend and we abandoned the plans for Peaked Hill because of the weather, but 14 points out of a possible 21 is ok and they will be there for another trip. Thanks to all the chasers and the property owners for the use of the hills and tracks. Great reading Mate and good pictures.